The Cardboard V2 with headstrap will take you into a amazing new worlds, travel across the global and walk on the moon in your room. Enjoy free immersive VR game, 3D movie, and 360 degree panoramic Live,games,videos,and images. 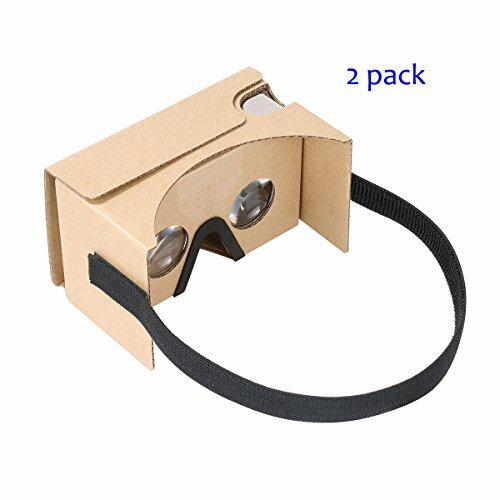 Our google cardboard V2 with headstrap made of AAA grade E-corrugated kraft paper and high quality optical Lens, all components pre-assembled in factory with well laid out install instructions,that give you a good experience! 1. Download "cardboard" from Google play or Apple store and install the "cardboard" App in your smart phone. 2. Place your phone into the VR viewer and open the "cardboard" App. 3. Move your head and PRESS the Conductive Button to select the content what you want to see. 5. 360 degree panoramic views,games,videos and images. 6. Our Google Cardboard V2 fit for 3.5"-6" cell phone, that width under 3.35". IHUAQI is a registered trademark in the USPTO, and it also enrolled in Amazon Brand Registry. BEST VISUALS: You can experience a truly stunning, engrossing immersive VR experience with cinematic HD visuals. COMFORTABLE DESIGN: Add one piece soft nose foam pad and one piece forehead sticker, so the vr headset will be more comfortable,anti-oil and sweat-proof, that keep your vr cardboard clean. If you have any questions about this product by IHUAQI, contact us by completing and submitting the form below. If you are looking for a specif part number, please include it with your message.